-Life is suffering mentally and physically in the forms of sickness, injuries, aging, death, tiredness, anger, loneliness, frustration, fear and anxiety, etc. -All these suffering are caused by craving (yù wàng 欲望). A self-centered person with continuous wanting from others will cause mental unhappiness. In turn, it will cause physical exhaust and fatigue in life. -All sufferings can be overcome and avoided. When one gives up endless wanting and endures problems that life evolves without fear, hatred and anger, happiness and freedom will then be obtained. Overcome the mentality of self-center and selfishness, one will then spend time in meeting others needs and feels life more fulfilled. 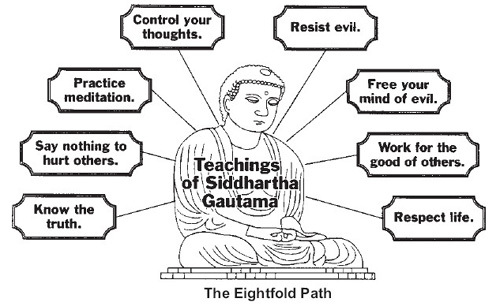 -There is a Noble Eigthfold path leading to overcome the suffering. The Eightfold path (bā shèng dào 八圣道) includes Perfect Understanding, Perfect Thought, Perfect Speech, Perfect Action, Perfect Livelihood, Perfect Effort, Perfect Mindfulness and Perfect Concentration. Buddhist practice the above in developing spiritually into a perfect person. This is said to lead one into the ultimate happiness in life and even afterlife. 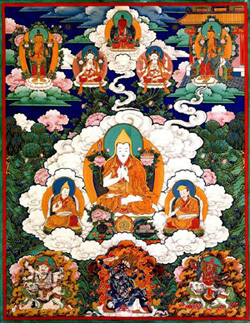 Buddhism also promotes code of conduct in life. That is what they call Five Precepts of avoiding killing, stealing, indulging, lying and alcohol drinking. Buddhist teaching introduces the way and concepts of meditation (míng xiǎng 冥想), rebirth, intellectual development and comparisons. It leads to self-understanding, instead of blind believing. Jing'an Temple (jìng ān sì 静安寺) in downtown Shanghai. Recently rebuilt, it was established in the Three Kingdoms era.Today the most popular form of Buddhism in both mainland China and Taiwan is a mix of the Pure Land and Chán schools. More recent surveys put the total number of Chinese Buddhists between 660 million (50%) and over 1 billion (80%), thus making China the country with the most Buddhist adherents in the world, followed by Japan. 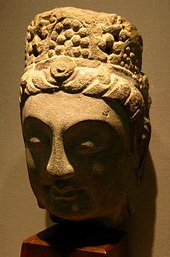 However, it was difficult to estimate accurately the number of Buddhists because they did not have congregational memberships and often did not participate in public ceremonies. Many lay people practice Buddhism and Taoism at the same time. Buddhism is tacitly supported by the government. The 108-metre-high statue is the world's tallest of Guanyin (guān yīn 观音) Statue of Hainan was enshrined on April 24, 2005 with the participation of 108 eminent monks from various Buddhist groups in Taiwan, Hong Kong, Macao and Mainland China, and tens of thousands of pilgrims. The delegation also included monks from the Theravada and Vajrayana (zàng chuán fò jiào 藏传佛教) traditions . 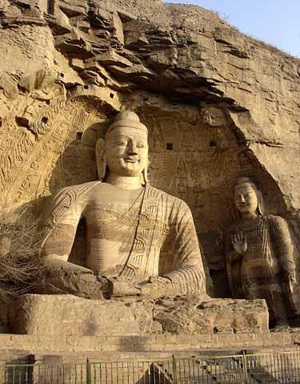 China is one of the countries where owns many world's highest Buddhist statues. 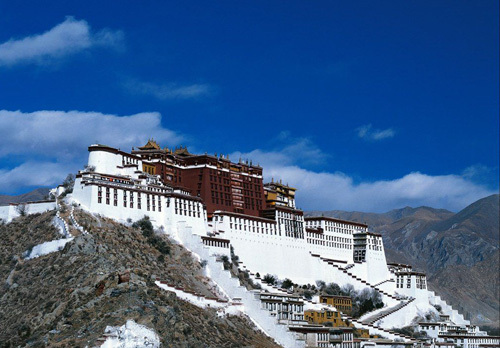 In April 2006 China organized the World Buddhist Forum and in March 2007 the government banned mining on Buddhist sacred mountains. In May of the same year, in Changzhou, world's tallest pagoda (bǎo tǎ 宝塔) was built and opened. In March 2008 the Taiwan-based Tzu Chi (cí jì 慈济) Foundation was approved to open a branch in mainland China.